The Extinct Scene: Late Modernism and Everyday Life (Columbia University Press, Modernist Latitudes Series, 2016). In this study, I try to unfold the relationship between late modernism’s various forms of attention to everyday life and the upheavals in the world-system that shifted the locus of power from Britain to America after the Second World War. I argue that late modernism undergoes an outward turn to everyday life: we can see the forms this outward turn assumes in phenomena as different as the late work of Virginia Woolf, the rise of the documentary film movement, the war travel books of George Orwell, W.H. Auden, and Christopher Isherwood, Elizabeth Bowen’s gothic war stories, and the post-imperial vernacular fictions of Sam Selvon, Vic Reid, and Colin MacInnes. You can read the excerpted "Introduction" here. 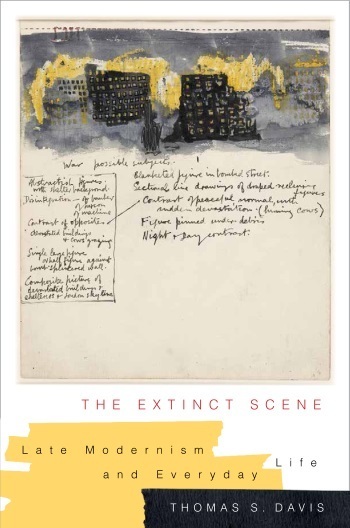 The Extinct Scene has also been shortlisted for the Modernist Studies Association Book Prize (winner to be announced in August). Allan Hepburn's review for Modernism/Modernity.